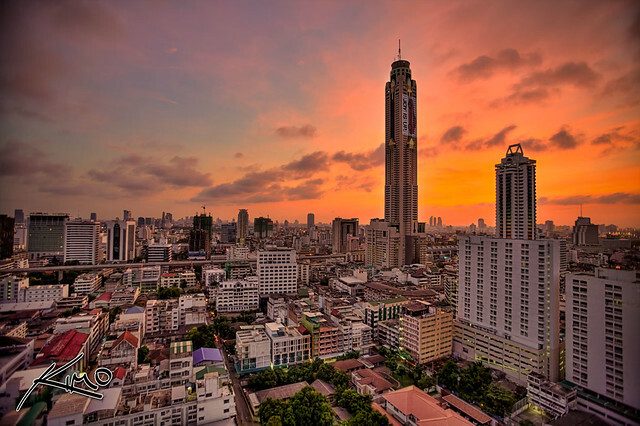 It is virtually impossible to go sightseeing in Bangkok and not see the Baiyoke Tower 2 – after all, it is Bangkok’s (and in fact Thailand’s) highest building, and a hard to miss landmark. It features a large BMW advertisement, and I’m quite sure that the Bavarian company has shelled out a good amount of money for that prime space. You can go all the way up to the observatory deck on the 83rd floor. It’s revolving and you get a full 360 degree view of the city from there. You’re not even beind a glass window – there is just a fence to protect people from accidentally falling (or jumping) down, so you can actually feel the wind and hear the sounds of the city. It’s quite impressive. It is also the world’s fourth-tallest all hotel structure, with 673 guest rooms. In total, this building is more than 300 meters high – according to their own promotional materials, it is 309 meters high, according to information submitted by the structural engineering company it is “just” 304 meters high. But let me assure you this: once you stand up there, this 5 meters really don’t matter. It’s an impressive Bangkok sightseeing spot. Although, there is an even better place to get a great view of Bangkok.